Place the ground beef in a large saute pan over medium-high heat. Use a wooden spoon to crumble the meat. Add the onion and potatoes to the pan, and stir to incorporate. Sprinkle the mixture with the salt, red chile powder and cumin, and cook, stirring often, until the meat is cooked through, 7-8 minutes. Add the garlic, and saute 1 minute more, until fragrant. Pour the water evenly over the mixture. Bring to a low simmer; cover. Simmer for 20 minutes, stirring occasionally, until the potatoes are softened. Remove the lid and simmer for about 10 minutes more, until liquid is completely reduced. Set mixture aside. Preheat oven to 350. Lay a tortilla flat, and spoon about 1/2-3/4 cup of the filling onto the center. Fold in the left and right sides of the tortillas by 1 inch to seal the ends and prevent filling from falling out before rolling up burrito-style from top to bottom. Place seam down on an oven-safe plate that has been sprayed with non-stick spray. Smother with green chile sauce and sprinkle with a generous amount of cheese. Repeat with remaining tortillas, filling, sauce and cheese. Place plates in the oven and bake until cheese is melted and sauce is bubbly, 10-15 minutes. Remove from oven and allow to cool for about 5 minutes before serving at the table on pot holders or trivets. (Plates will be very hot!) If desired, garnish with a dollop with sour cream and serve with your favorite Mexican food sides and a green salad. 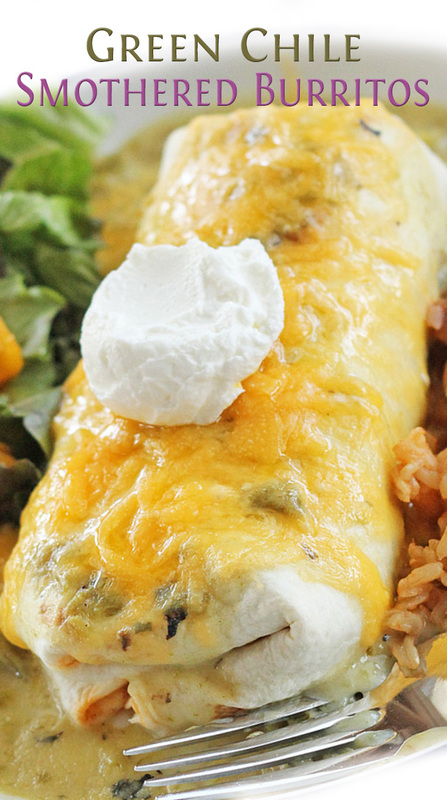 To feed a crowd, these burritos can be prepared and placed in a large casserole pan to be baked all at once. Baking time should be extended to 20-25 minutes.